Acknowledged author wrote INTRO TO CHEMICAL ENGINEERING THERMODYNAMICS 8 comprising 768 pages back in 2016. Textbook and etextbook are published under ISBN 1259696529 and 9781259696527. 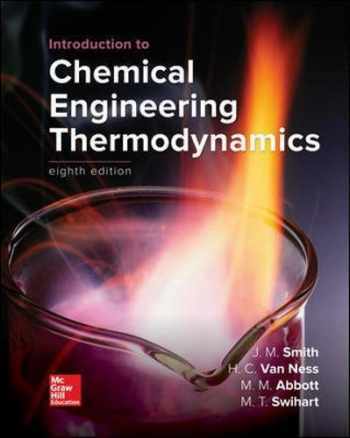 Since then INTRO TO CHEMICAL ENGINEERING THERMODYNAMICS 8 textbook received total rating of 4 stars and was available to sell back to BooksRun online for the top buyback price of $63.71 or rent at the marketplace. Introduction to Chemical Engineering Thermodynamics presents comprehensive coverage of the subject of thermodynamics from a chemical engineering viewpoint. The text provides a thorough exposition of the principles of thermodynamics, and details their application to chemical processes. The content is structured to alternate between the development of thermodynamic principles and the correlation and use of thermodynamic properties as well as between theory and applications. The chapters are written in a clear, logically organized manner, and contain an abundance of realistic problems, examples, and illustrations to help students understand complex concepts. New ideas, terms, and symbols constantly challenge the readers to think and encourage them to apply this fundamental body of knowledge to the solution of practical problems.McGraw-Hill's Connect, is also available as an optional, add on item. Connect is the only integrated learning system that empowers students by continuously adapting to deliver precisely what they need, when they need it, how they need it, so that class time is more effective. Connect allows the professor to assign homework, quizzes, and tests easily and automatically grades and records the scores of the student's work. Problems are randomized to prevent sharing of answers an may also have a "multi-step solution" which helps move the students' learning along if they experience difficulty.